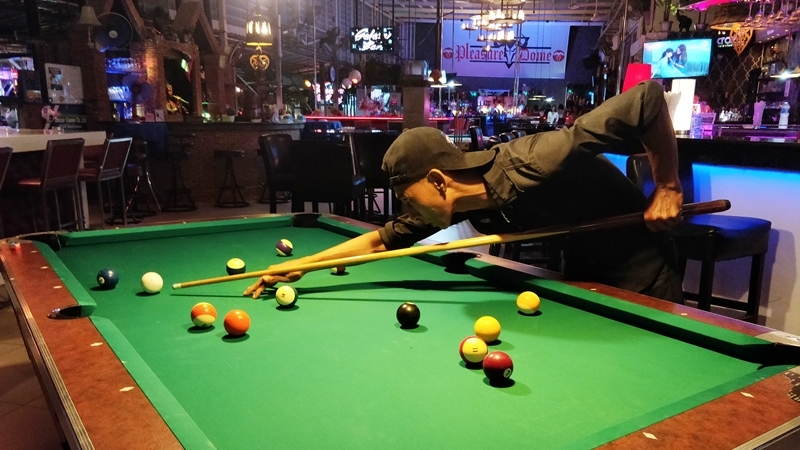 POOL: The Rawai Pool League (RPL) is up and running for its 14th season, with a newly introduced dual-division format where the six newcomer bars participate in Division B along with the lower-ranked teams, while Division A includes last season’s top 12 teams. After three weeks of play, Shot Bar currently stand top of Division A on nine points, leading Mango Bar only by difference in frames won. Both teams have won three matches, with last season’s league favourites Black Sheep suffering a shock 5-2 home defeat on Monday (Aug 13) to a strong Black Pearl team. Division A looks to be gearing up for a tight battle this year – expect plenty of upsets. Aside from the play, Mango Bar’s impressive start to the season sees them presenting their opponents with mangos before each match, as they did this past week against Tropical Sands who are yet to get any points on the board along with Orange Bar, who probably had the toughest early fixtures of any team. Expect Orange Bar to move up the table in the coming weeks. Luke (Shot Bar) and Thong (Mango Bar) currently top the individual rankings, with Dum (White Hart) sitting out Monday’s game against Pita Bar in another 4-3 epic between these two long-standing rivals. Division B has provided excitement, with strong openings to the season for newcomers Roses and Stor bars, who currently sit atop the new division. Both new teams feature strong players who also feature highly in the individual rankings. Although early in the new season, both these teams look like strong contenders for promotion to Division A next year. Catching up with Week 1 action, in Division A White Hart Bar played host to Orange Bar. After an unconvincing start by the visitors, they managed to pull the match back to 3-2 when a self-called foul by Noi allowed the home team to seal the match with the second Double’s win. There were also opening night wins for Pita Bar in their home match against Future Bar (4-3), Black Pearl at home to Freedom Bar (4-3), Spot Bar who hosted Tropical Sands (5-2), Shot Bar with a convincing 7-0 win against Masaya Bar, and Black Sheep who won 5-2 at Freedom Bar. Meanwhile, Division B saw strong starts for the league’s new entrants. Standing out was Roses Bar with a 7-0 away victory against Kilt’n Haggis. Meanwhile, White Hart B and Stor Bar both registered 2-5 victories in their away matches to Black Bull and The Stoned Crab respectively. All-female team Pink Sheep registered a good opening night 3-4 away victory against Moonlight Bar. Laguna-based Baroque Bar saw their season off to a great start with a convincing home 5-2 win against newcomers O’s Bar. Finally, the Islander derby saw Islander A beat their B rivals with a 3-4 victory decided by the final frame of the beer leg. In week 2, an off-par White Hart Team lost to Shot Bar despite a strong opening in the singles. Shot Bar’s Luke got their first points on the board, but the match was evenly balanced at 2-2 after the singles. Expectations were high for last year’s league winners, but Shot Bar took both doubles and the beerleg to card a 2-5 away win. League favourites Black Sheep produced a 7-0 whitewash against guests Orange Bar, despite three of the four singles games going to a deciding frame. Meanwhile, Spot Bar’s Eddy prevented the same fate for his team, who lost 6-1 in their away game at Future Bar. Masaya Bar upset their local rivals Pita Bar with a deserved 4-3 home win. Tropical Sands continued their difficult start to the season, with Mango Bar taking home a 2-5 away-win. The final Division A game saw a good 4-3 home win for Black Pearl against a strong Freedom team. In Division B, Black Bull produced a 7-0 drubbing of their French compatriots Baroque Bar. Similarly, Roses Bar continued their run of whitewash victories against Islander B, despite both doubles matches going to the wire. The Islander’s A team lost at home to Stoned Crab in a fun game. Maybe Mark brought the sandwiches out too early! Only Otis from O’s Bar was able to get on the board in their home defeat to Kilt’n Haggis. Mark and Phil brought White Hart B back into contention after Fern and Pattie of the Pink Sheep had taken an early advantage. But a tight doubles games against Friedhelm and Eric saw the match get away from the girls, despite Pink Sheep winning the consolation beerleg. The last match of the night saw newcomers Stor Bar host Moonlight Bar, with only Gianni’s singles win against Mikah halting a whitewash run by the home side.